Lots of Lawyers, or 'LOL' for short, evolved several times from a 'ZocDoc for lawyers' to a lawyer social network. I co-led a 4-person team to build a prototype that won us an elevator pitch competition, Startup Scramble Weekend at the Harvard Innovation Lab, and several conversations with lawyers and bar associations interested in using the product. As a foodie, I loved working on this app which gamified the restaurant discovery experience. Spotcheck was my first iPhone application. I worked with a friend to build an app that allowed users to crowdsource feedback through picture sharing. You may feel annoyed that no one app remembers all of your online activity. 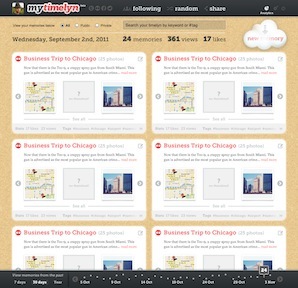 Timelyn aggregates all of your experiences in one place. We realized quickly that we were on to something when several funded startups built similar solutions. HackHarvard brings tech entrepreneurship to Harvard College, provides resources for aspiring entrepreneurs, and fosters a strong community of students who will be responsible for building the technologies of the future. While in school, a friend and I found that far too many people asked the mundane question, "So what did you do over summer break?" Lincups allowed users to chart their future plans and past experiences on a map they could share with friends. Others could use the tool in many ways (e.g. to find a roommate for the future, get advice from someone who had visited in the past, or to see what friends were up to). A close friend and I realized that no organization focused on the education and research of renewable technology, so we created one.